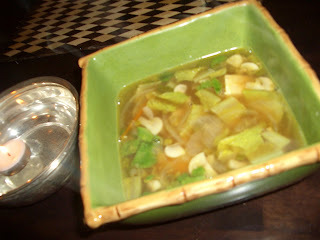 This was an interesting recipe, that was trying to emulate a soup I had at a nearby Ann Arbor Restaurant 'LotusThai'. I always fall in love with soups at these thai, chinese, and indo-chinese restaurants, and can never completely recreate in my kitchen! They are so good! My husband tried his hand at this time, and it turned out amazing...check it out below. Saute the mushrooms on high heat in sesame oil. Add the onions, and then add the ginger for a few seconds. 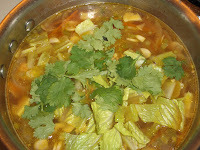 Add the stock, sauces, vinegar, salt, pepper, and simmer. Add the carrots and radish. Let the vegetables cook but keep them crispy. Add the green onion, and green chili. Just before serving put in the lettuce or chinese cabbage. Garnish with coriander and a little chopped green chili (if you desire the heat!). Check out the results below! Here is my husband dressed up as a Mongolian chef for a charity event he did cooking at the Mongolian Barbeque in Ann Arbor!